• Office partition offers privacy to all employees. • Considered a cheaper alternative to setting up permanent walls. • Takes care of any future expansions that may come up. Glass Partition – Glass partition has become very popular as it is usually made out of glass and aluminium. 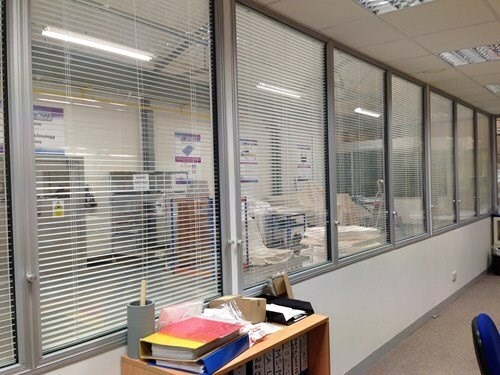 These partitions are available in half and full panels which offer the employees full privacy with optional venetian blinds. Once of the main advantages to using glass is it offers protection from noise pollution and allows natural light to come through. 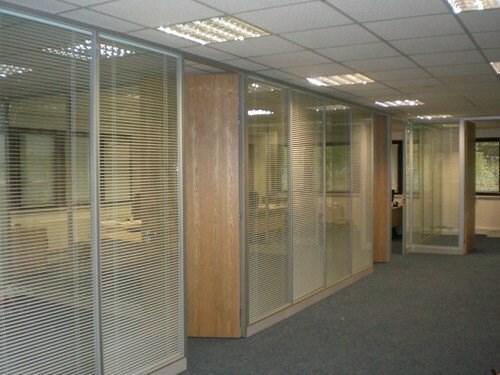 Floor to Ceiling – This is a common option chosen by offices. It is use to break up the work spaces and tend to come in full height. In this kind of partitioning the employee is not fully enclosed and noise pollution can seep. There is usually clear visibility of other employees and this type of partitioning is typically made from metal. The floor covering will usually be made from a type of cloth. Advantages of using this type of partitioning is the ease of removal and adaptability. Portable – These types of office partition are commonly used on a temporary basis due to their flexibility and ease to move from one place to another. However, minimal privacy is offered but do minimise the noise pollution. Cubicles – Cubicles are the most common type of partitioning used by offices. They usually come in half heights and offer more privacy. Choosing the size and shape is very flexible and can be done by simple moving the walls. These are usually used for a computer work space, work desk, filing set up area or any other related work space. Accordion Walls – One of the main advantages for using accordion walls is how easily moved are. These wall offer full enclosure for privacy and work similarly to floor to ceiling partitions. By using this guide to understand the types of partitioning available for your office this should help you consider all your options before carefully choosing what type of partitioning to go for.